The scene in the Indiana locker room following Thursday’s opening round Big Ten Tournament loss to Illinois at Bankers Life Fieldhouse in Indianapolis was hard to process. Less than a year ago, Indiana players sat in front of their lockers in Chicago following a loss to Wisconsin in the Big Ten tournament with disappointment on their faces, but with hope for what was still possible in the NCAA tournament. This year’s scene had no such hope, aside for one of an NIT bid, as the looks of defeat on the faces told the story. The season was over. No, it wasn’t surprising that the Hoosiers had just dropped their third straight game to close the season to Illinois, a team that had won four of five heading into the Big Ten tournament. What was surprising and difficult to comprehend, however, is just how hard and far Indiana had fallen. Less than a year removed from winning the outright Big Ten championship and earning a No. 1 seed in the NCAA tournament, the Hoosiers would be staying home in March. Earlier in the season, after the first Illinois game to be exact on the timing, I warned of a transition year in Bloomington. Many IU fans didn’t want to hear it, but the general vibe from watching up close was that the Hoosiers would have a difficult time making the NCAA tournament again given what had transpired through the first 14 games. It wasn’t an excuse, just the reality of what I was seeing given the turnover problem and challenges offensively. It was a sign of what was to come when Indiana lost its Big Ten opener at Illinois even after a brilliant offensive performance from Yogi Ferrell. Ultimately, I wrote that this Indiana team should be judged by adjustments and improvements over the course of the season. The problem, which became crystal clear with the news last night that IU failed to make the NIT, is that this wasn’t a year of transition. It was a step back. At Indiana, the expectation is to make the NCAA tournament every season and compete for Final Fours and national championships. It was an expectation that was justifiably forgotten for three years as Tom Crean navigated through the mess he inherited. Crean deserves major credit for resurrecting the Indiana program, advancing to two Sweet 16s and winning the Big Ten last season. But in year six, the expectation is to reach the tournament every year. Indiana didn’t get there this year, nor to the NIT, which could have been a decent consolation prize for a young team, and the fan frustration that comes along with it is completely justified. This team should have been better than it was. So where did things go wrong this season? Start with the turnovers. After Indiana put together a pair of high turnover efforts in home games against Nicholls State and Kennesaw State, two teams that finished a combined 20-40, the IU players said the issue would get fixed. It never got fixed, at least not consistently. 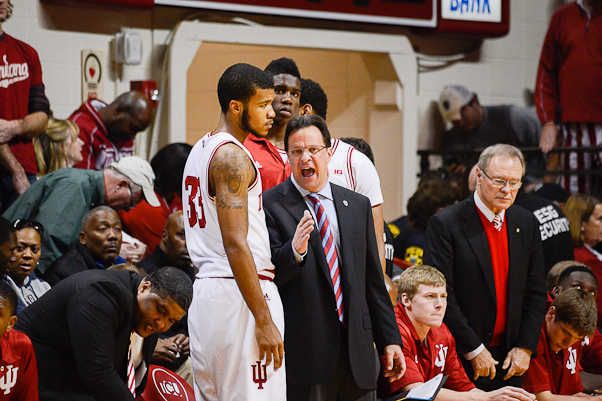 Indiana finished with a turnover percentage of 21.8, which ranked 330th nationally. This was a team that raised expectations at times by beating a pair of two NCAA tournament two seeds in Michigan and Wisconsin at home, only to lower them back down by losing to Northwestern and Penn State in Assembly Hall. At its best, Indiana could compete with the Big Ten’s best. And at its worst, it was capable of falling to the league’s worst teams. Continue the list of issues with the fact that no Big Ten team had more of its shots blocked than Indiana and only one Big Ten team had a worse 2-point field goal percentage defense than the Hoosiers in conference play. Also throw in that Indiana led at halftime in 10 of its 18 conference games but only won four of those games. IU also finished 3-11 in games away from Assembly Hall. The non-conference home schedule, another area of criticism, is already being addressed for next season with the addition of SMU, a likely top 25 team. The problems weren’t isolated to the court, either, as the Hoosiers had Luke Fischer transfer midseason, Jeremy Hollowell benched for three games for an undisclosed reason and Hanner Mosquera-Perea arrested on an OWI charge. A metal beam also fell into the seats of Assembly Hall, causing a postponement of the Iowa game. Add it all together and you arrive at the conclusion that it’s fair to call the season a step back. But the season is over, which means what happens next is where the attention now turns. The roster will look different when practice begins next fall, but should have the talent to get back to the NCAA tournament and into the top half of a Big Ten that will have 14 teams. That’s exactly what needs to happen, too. The program cannot afford a transition season or another step back in 2014-2015. It is, after all, Indiana. The past couple years, yes, but I don’t think we can throw the team that gave UK there best game in the tourney in that grouping. That team was clicking in March, and if they had a better draw, I think they could’ve made the Final Four. I know we all want the Indiana kids, and I’m certainly not against getting them either. However, I think we put too much of an emphasis on getting Indiana boys instead of getting boys who plays like they are from Indiana. Let me explain: I think what we all value is hard work, discipline, high BB IQ, hustle, coachability, etc. There are many players outside of Indiana who have those same qualities. I don’t really care if the player is from Indiana or not, but I DO care if he possesses those qualities. We could all list a bunch of non-Indiana players at IU who were “Indiana players.” That’s what we want…but getting players from Indiana is good too. I really hate to say this, but at this point, can you blame him? I’m not really talking about any specific basketball traits — more about percentage chance of landing really good players. The state has lots of them, and being THE basketball destination in their home state should give IU a better percentage chance to get that kid than an equally good player who lives across the country. Just a numbers game. I would like to see IU at least “in” on the most elite in-state players, whether they live 10 minutes from michigan border or in Evansville. Not going to get them all, but IU’s perceived basketball status needs to move to a point where the very best Indiana kids consistently at least give thoughtful consideration to becoming a Hoosier. If somebody can make that happen, I like the program’s chances of returning to a consistently high national level. Keep an eye on what Painter does with Basil Smotherman…another under the radar guy who showed glimpses of potential. I think that’s a reasonable point and expectation. I think Crean has done pretty well at this (much better than Davis or Sampson), but we’ve lost out on some of the biggies of late. I don’t think we ever had a real shot at Harris with his mom being a PU alum. Agree. Think the committee was BS in sticking IU into the same regional as UK that year. The last thing I have to say about this article is that going from #1 to missing the NCAA tourney altogether, is WAY more than a step back. Ok… I have not commented much this season because I rarely wanted to come out of my pit of despair. This season was so dreadful to watch. It really felt watching the 2010-11 season. You knew there were pieces there that could be good… they were just missing something. I think that is what we have with this season. And until we start understanding that development is the key to college athletics, we will continue to have high hopes dashed upon the rocks of youth and inexperience. Look at the starting lineups for consistently good teams. They all have solid 2-4 year players that have developed. We have the pieces. They just need to grow into their potential. The comments that people have been making about JH are the same kind of comments that were made about Watford in his first two seasons (wasn’t he even benched a couple times for lack of whatever?). Is Hanner really that different from Elston? Didn’t Elston have a few brief disciplinary issues? I know it wasn’t an OWI, but still. Kids need to mature. And it isn’t just us. You think that pUKe fans aren’t disappointed with this season? They had “the best recruiting class in the history of college basketball” and were preseason #1. Did they even finish the season ranked? If they played in the B1G you think they would have made the tournament? Doubtful. So all of this diatribe is just to say, sometimes we have down years. Every program does (UNC, UK, KU) except Duke… they’re an anomaly. I fully expect us to markedly improved next year. If we can land one more “missing piece”, I think our improvement will shock some people. Look for JH to have a breakout year. Look for Yogi to continue to be the best player on the court but start to become the smartest player on the court. Look for StanRob, Troy, HMP, DDavis, and the others to continue to improve and be solid cogs in an increasingly well-oiled machine. It is not fair to expect them to be that now. I know there are those that will clamor that we haven’t seen the improvement from game to game this year. But I guarantee that if you look at the comment boards from the 2010-11 season will look pretty similar. Sorry for the long post. Hope it provides a little of the perspective that has helped through this cluster-hoo-haa of a year. I do not hate Crean, I do not care that he makes his personal religious beliefs so public and I don’t care about falling from the top seed in last year’s NCAA to not making the NIT this year. I do car about game play –I watched and observed what many others have pointed out about the hoosiers game play. Last year(and this year) we lost games because of strange substitution patterns, poor clock management and lack of preparation. but losing to Syracuse last year and then hanging a banner and passing out rings for the sweet 16 appearance was just embarrassing. I found it offensive that Crean never took any responsibility for the syracuse loss– if he did I missed it. I prayed that he would improve as a coach for the 2013-14 season and nothing changed except some mid-season improvement in substituting. But his more rational substitution scheme seemed to follow after the fans at assembly hall booed when they saw how he was mismanaging the game. If Crean does not improve as a coach then nothing will change. He does recruit top athletes and they do win games because of their talent but so often this season I watched as opposing coaches made adjustments during the game and we lost games that we should have won. Crean can build a team the problem is he does not know how to coach– he should seek guidance and I’ll be praying once again that he does but am not expecting he’ll improve as a coach. Let me say this again, I do not hate him I am just disappointed in him as a coach. Again: Can the condescension. As well as the attitude. Trying to claim you respect others falls flat so soon after you deliver insult not once but twice, and it also shows you do not care to examine your own behavior. This is why you got the response you did. You got the response you deserved. Had you been more humble and less insulting, the responses would be kinder and more friendly and you wouldn’t have had a post deleted. But that’s not the way you behaved, so that’s why you’re getting the posts you see. Thanks for the sermon dude, now please leave me alone. I’m on here to talk basketball, not morality and behavioural psychology. I know the feeling of having your expectations totally turned on its head and made unrecognizable. I was one of the guys who was saying “Hey, I don’t think this season is going to be as good as everyone’s saying it will; we’ll beat some teams we’re not supposed to, but lost some games we’re suppose d to win”… But even so, I was still shocked at how bad it all turned out; I figured we’d be a low seed in the NCAAs, not an NIT reject. And to make matters worse, I was even wrong about why things wouldn’t be so shiny: My thought was that Noah was going to need to get his feel for the college game first and the team would have to rely on outside shooting to get any wins before he came into his own. I couldn’t have been any more wrong with that had I tried. So yeah… I had lesser expectations than a lot of people, and I still ended up utterly shocked. It taught me I don’t know as much about this team as I thought I did. Anyway, yes, the next season’s got to be better. That’s more than stating the obvious: It’s setting an expectation. It has to be, or the gains of the prior 2 years will be perceived as wasted, and that can harm recruiting. I go back even further to MSU’s “Jumping” Johnny Green or Creighton’s Paul Silas…best 6-6/7 rebounders I’ve ever seen. You want to be left alone? Don’t insult thread participants. End of story. I only remember the tail end of Silas’ NBA career, so in that category I’d have to say Barkley and Rodman (I know they listed Rodman at 6’8″ and Barkley at 6’6″, but both were generous. What expectations? Is making an ncaa berth that much to ask? Too much talent on this Indiana team to miss the dance AND the NIT. Potential top 5 draft pick in Vonleh, last years Big Ten sixth man in Sheehey, two more very talented and athletic freshmen in Stan and Troy, and a guard that knows how Indiana works in Yogi. Fans have begun to turn on Crean but if he can come back next year and make a deep run in the the tournament, all will be right in the world. But if he fails to dance again…hell will be risen. Great post. Completely agree on all counts. And if the “culture” affects the basketball program, it becomes a relevant issue. Crean most certainly doesn’t shy away from the issue and obviously has no problem mixing his personal belief system with his public life. Fine, expect it to be discussed. I would venture a guess that discussion of his religion is exactly what he wants. One quick scan of his twitter page confirms that. If he wants a discussion, it’s not with him. Twitter doesn’t seem like much of a discussion platform, almost by definition. You basically have people saying here is what I sound like tweeting. You can follow my tweets and get a sense for what I’m about, but we don’t get to discuss it. If he intends to put things out for other people to discuss, without his direct involvement, I don’t know. Yes, he obviously wants a general discussion about his brand of religion. He uses twitter as a vehicle to evangelize by example — that’s the only reason to do what he does. Certainly it is his right to live his Christianity so publicly, he is obviously committed to his beliefs. But doing so invites a certain level of discussion about it. It is not unreasonable to wonder, as an IU basketball fan, what (if any) effect it has on the program. Don’t get me started. I could do a post-modern/post-colonial critique, lol. Thanks for the reply–living on the left coast now, I see fewer games, and most of what I saw was any players (except the guards) dribbling upright and getting jammed in the open court. Must have looked better when the creampuffs let our guys run free.